Dr. Özen graduated from METU Biology department in 1999. Between 2001-2007, he conducted PhD research on structural biology at the Graduate Program of Genome Science and Technology, University of Tennessee (Knoxville)-Oak Ridge National Laboratory. Since 2008, he is a faculty member of Biotechnology Graduate Program. 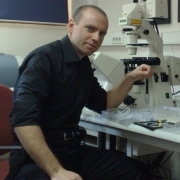 Dr. Özen is also the coordinator of Central Laboratory Light Microscopy Facility and steering committee member of Center of Excellence for Biomaterials and Tissue Engineering. He led or participated in METU and TUBITAK-funded projects on biosensors, quantum dots, synthetic biology, peptidomics and cancer drug discovery. In 2014, he founded an SME specializing on venom-based bioactive peptide discovery.